Shinhan Financial Group building in Seoul, South Korea, featuring PV glass from Energy Glass. If you’re in the solar business, it’s hard not to look at a glass-fronted building and wonder: why not produce energy with that? The idea of turning glass surfaces into energy-generation sources is seemingly obvious. But it has had trouble catching on in practice. Building-integrated PV (BIPV) “always seems to be on the horizon,” says Christopher Klinga, the technical director of the Architectural Solar Association (ASA), a trade organization focused on bringing the solar and building industries together. Year after year, he says, BIPV is predicted to see explosive growth. Year after year, though, the percentage of solar installations integrated into building surfaces, instead of being built on roofs, remains tiny in relation to PV deployments overall. Could things finally be about to change, though? Jeff Horowitz, director of business development and partnerships at photovoltaic window technology specialist NEXT Energy Technologies, believes so. Part of the reason, he says, is that the need to save energy in buildings is becoming too big for developers and architects to ignore. One way to do this is through on-site solar generation, which is also being fostered by regulations promoting net-zero energy buildings. “Japan, California and Europe all have requirements looming,” says Horowitz. Putting a few solar panels on the roof simply won’t be enough to deliver net-zero energy on tall buildings such as office blocks, notes Horowitz. Hence there is a growing gap in the market for the integration of PV into building facades and windows. The key driving force for BIPV in Europe, which constitutes 42% of BIPV’s global market, is the European Energy Performance of Buildings Directive, or EPBD. This states that all new buildings in member states should be nearly zero-energy buildings (NZEBs) by 2020. “Clearly, one possible solution to realize NZEBs is the generation of renewable electricity on-site by means of building-integrated photovoltaics,” Horowitz says. The EPBD is expected to lead to a tenfold increase in the European BIPV market by 2020, especially since it is being reformulated to include building renovations. Elsewhere, too, a growing use of glass in building facades is running up against regulations for energy efficiency. The fact that BIPV could serve the needs of energy planners and architects alike is continuing to drive rosy forecasts for what is increasingly being renamed architectural solar. Analyst firm N-tech Research, for example, believes the global BIPV market will expand from $2.9 billion in 2018 to $11.6 billion in 2027. But that doesn’t mean the path to growth will be plain sailing. “Unlike traditional generation, architectural solar is quite complex and depends on the cooperation and collaboration of numerous stakeholders,” says David Beckham, director of building-integrated photovoltaics at Walters & Wolf, a West Coast cladding services provider. These stakeholders tend to have a limited appreciation of renewable energy, says Laurent Quittre, president and founder of Issol, a Belgian architectural solar specialist. But they do understand glass. 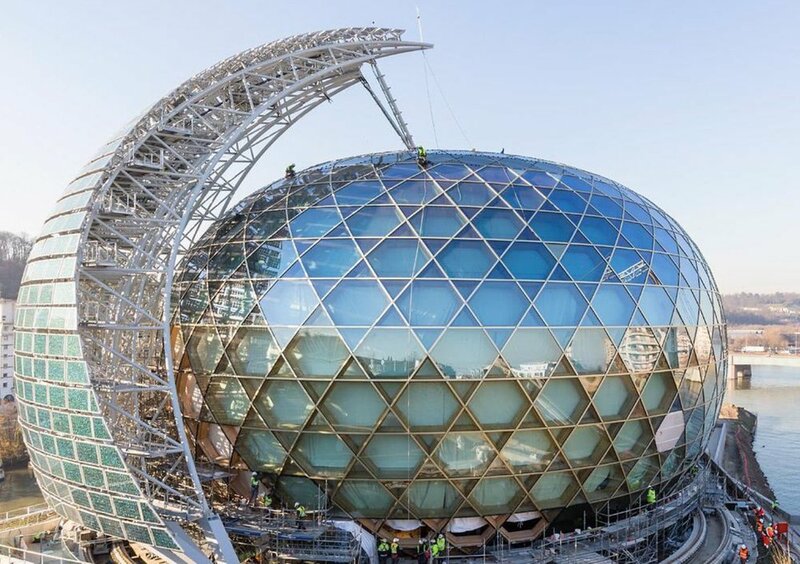 The stunning La Seine Musicale in Paris, featuring PV glass manufactured and installed by ISSOL. “If you talk to them about a glass that integrates technology, then they are interested,” he says. For real building-materials credibility, it would also help if major glass manufacturers joined the BIPV bandwagon. Many are reluctant to do so, though, because of the failed BIPV promises of the past. Pitching BIPV as a new building material, rather than a source of energy, could help persuade these companies back into the fold. That is why the ASA believes the language around BIPV needs to change. “The definition of BIPV is flawed,” says Klinga. The switch from BIPV to architectural solar is much more than a branding exercise. It’s about a change of mindset from energy, which is important in the buildings industry, to materials, which are essential. “The architectural solar market is where the true opportunity lies,” Klinga says.